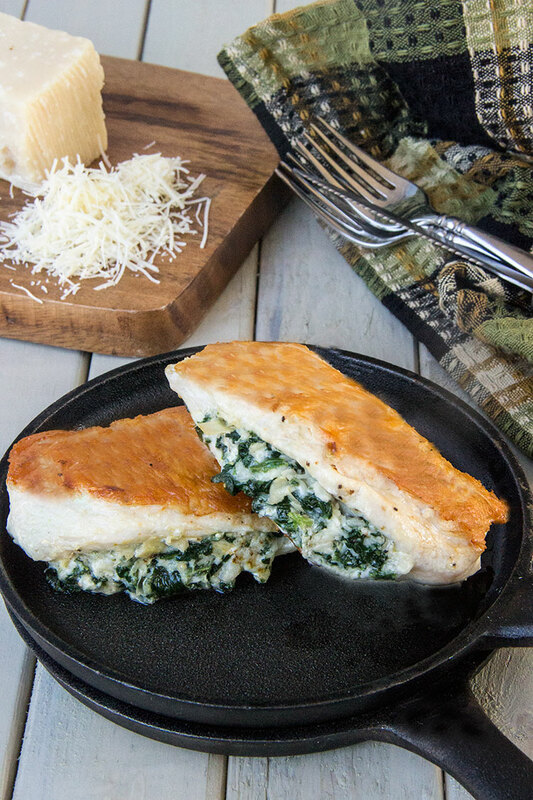 Meat-and-Potatoes-Guy and I are both big fans of cheesy and creamy Spinach and Artichoke Dip. We make it at home as a tasty dip alongside tortilla chips and often order it when we spot it on restaurant menus. I like the flavors so much, I started wondering how I could transform our favorite appetizer into a main event entrée. So I tried stuffing chicken with a cheesy spinach and artichoke mixture, and the results were really tasty. Anyone who claims that chicken is bland has probably not tried cheesy stuffed chicken! Here are the key ingredients you’ll need for this dish. 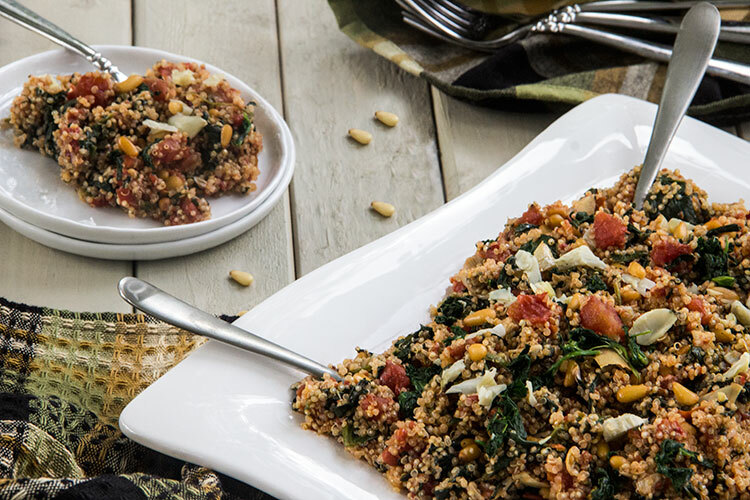 This recipe uses just a small amount of frozen chopped spinach and canned artichokes, so I use up the rest of the spinach and artichokes in my Mediterranean Tomato Quinoa, which I serve with the chicken as a healthy side dish. 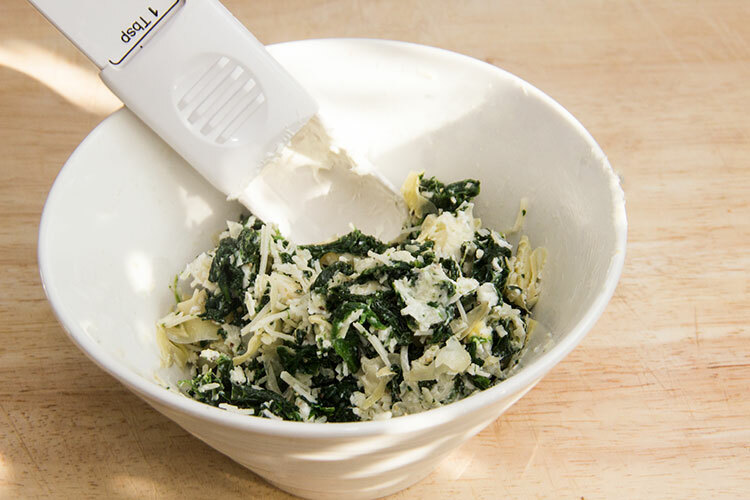 Begin by tossing a bit of frozen chopped spinach into a heat-safe container and thawing it in the microwave. 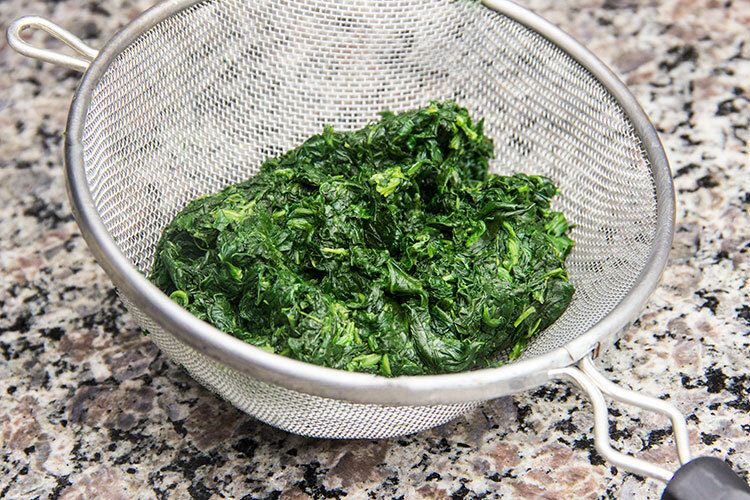 Place the thawed spinach in a fine mesh strainer over the sink or a large bowl. Then squeeze that spinach until all the water is removed. Wring it as dry as possible, because you don’t want the chicken filling to turn into a watery mess! 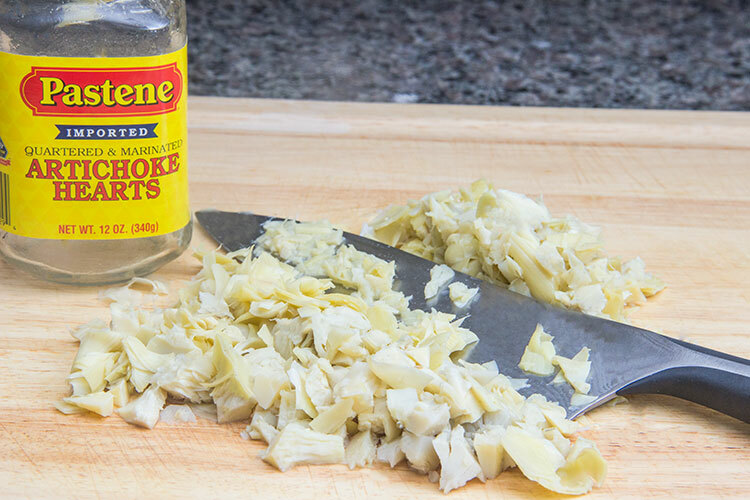 Next, grab a few canned quartered artichoke hearts, which add tons of nutrition to this dish along with their subtle flavor. Just be sure to throw the artichokes into a strainer and give them a good rinsing. 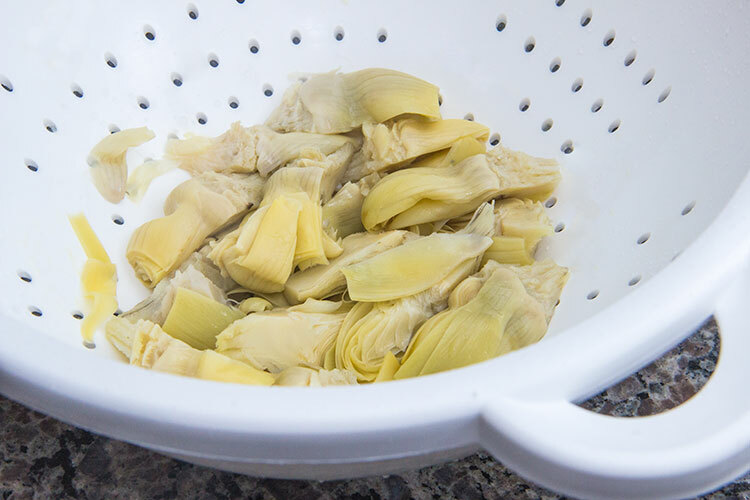 Canned artichokes are often marinated in vinegar, so you’ll want to get rid of that briny flavor by rinsing them thoroughly. Then chop up the artichokes into small, bite-sized pieces. 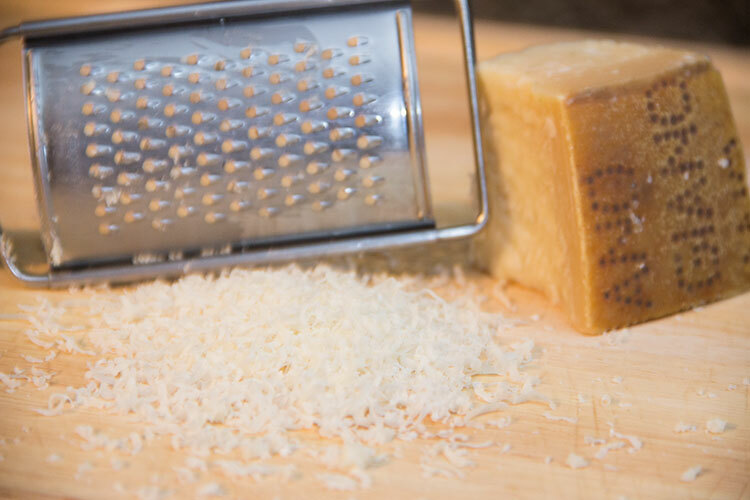 Grate a bit of parmesan cheese. 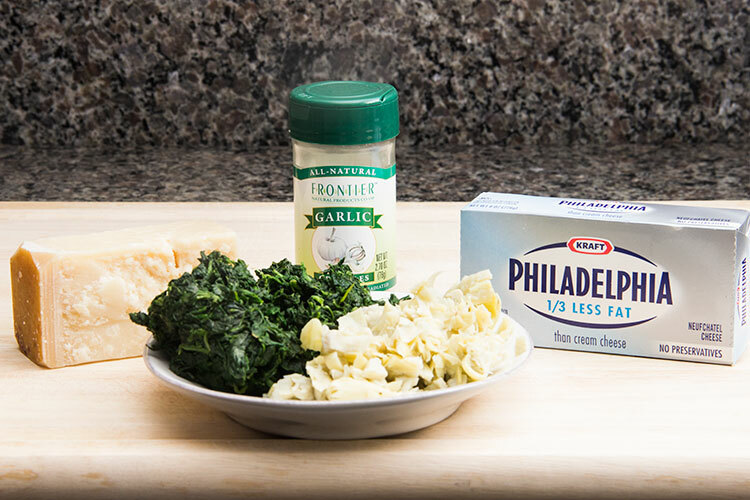 Then grab a mixing bowl and toss in the chopped spinach, chopped artichoke, and grated parmesan. Add a bit of Neufchâtel low-fat cream cheese, some garlic powder, and a pinch of salt and pepper. Then stir until everything is nicely combined. Next, grab a couple of skinless boneless chicken breasts, and season both sides with salt and pepper. Place them flat on a cutting board, and grab a sharp knife. Cut into the thickest side of each chicken breast lengthwise, leaving at least a one-inch seam all along the outer edges. Stuff plenty of the spinach artichoke filling into each “pocket,” packing it in thoroughly. Then it’s time to cook up the chicken. First, be sure the chicken isn’t still cold from the fridge when you begin cooking it up, or it’s more likely to stick to the pan – – by the time you’ve cut the pockets and stuffed the chicken, it probably won’t be too cold any longer. Next, heat up some olive oil in a sauté pan over medium-high heat. Wait for the oil to heat up before placing the chicken in the pan. Then cook the chicken for a few minutes – here’s the important part, – without flipping it, pressing down on it, or moving it around in the pan. 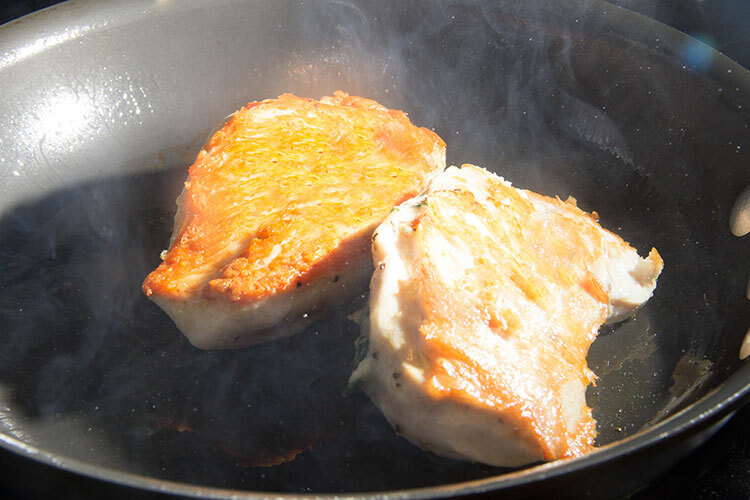 When you start to see the edges turning a delicious-looking golden brown, grab a spatula and flip the chicken, allowing the second side to cook in just the same way. After you’ve got a nice golden crust on both sides, use the spatula to carefully transfer the chicken to a baking sheet or casserole dish. Then toss it into the oven to bake until it’s cooked through to the center. And dig into a plate of comfort food so cheesy and richly flavored, no one will notice that there’s actually healthy stuff inside! The chicken outsides are crisp and golden, while the creamy filling helps keep the insides moist and tender. The spinach and artichokes also happen to be scrumptious complements to the chicken. And there’s plenty of gooey, salty, cheesy flavor in every bite. 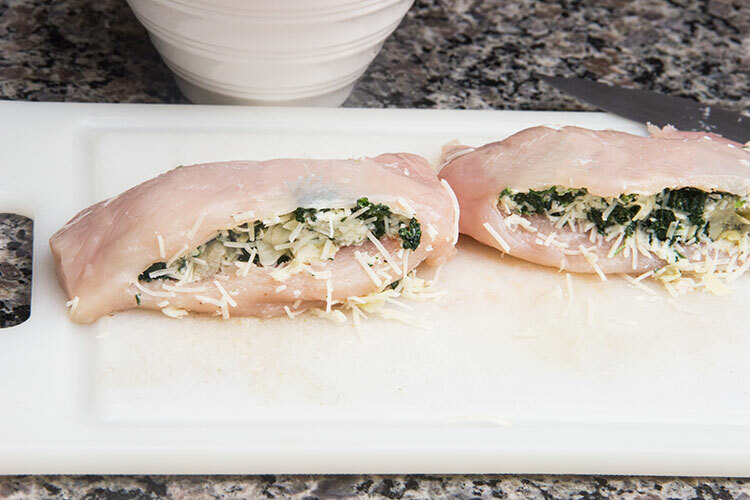 To help use up the frozen spinach and canned artichokes in this dish, I like to serve this stuffed chicken with (very nutritious!) Mediterranean Tomato Quinoa. 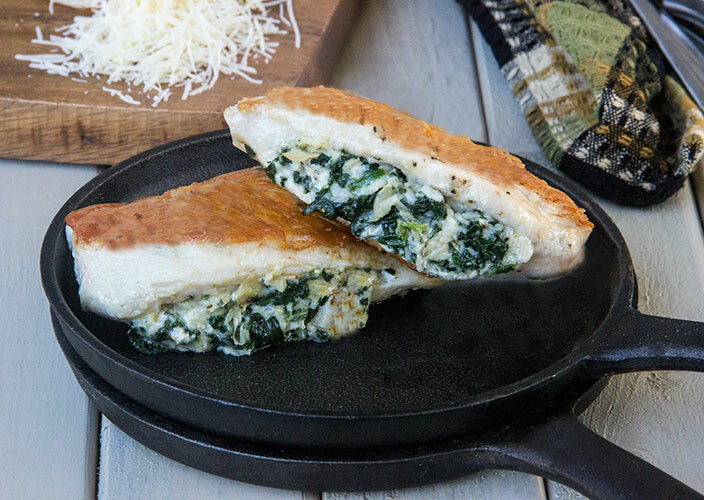 Find the complete, printable recipe for this cheesy stuffed chicken at the Spinach Artichoke Chicken Recipe page on Food Fanatic. Chicken stuffed with my favorite dip ingredients? YES PLEASE. Looks delicious! This reminds me of Chicken florentine, a favorite around here too 🙂 Looks delicious! 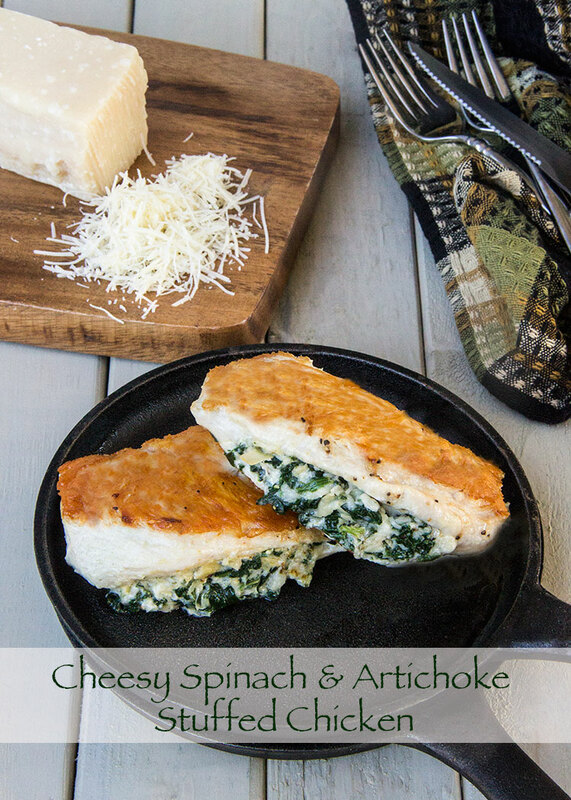 I love spinach artichoke dip and I love chicken so this is a match made in heaven! Oh yum — this looks so good! I love spinach and artichoke together. What a great dish!